Are you ready for the ultimate Irish themed video slot machine? You better be, this is because this Cryptologic video slot machine, Cash n Clover slots is an Irish themed slot game that invites you to take a trip down to Ireland where you can chase the rainbow to locate the pot of gold that is found at its end. Players will also enjoy the company of Leprechauns and many other aspects of the Irish culture. 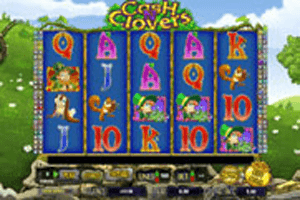 Play Cash n Clovers free slots here. Green is known to be the dominant color in the Irish culture and this is why it is the color that Cryptologic has chosen to dominate the interface of the game. As soon as the slot machine loads, players will notice the green color of the reels, the symbols and the background of the reels. In the background, players will see green fields with trees. Even the control panel is affected by that theme as the spin button comes in the form of a gold pot. This is why players who want to find the golden pot at the end of the rainbow will have to click on this pot first. The game comes in wonderful visuals and comes accompanied with great audio and greatly rewarding symbols and features. The game has a rewarding format of one-hundred paylines that players can place bets on. This means that players will have 100 chances of claiming a payout through this game through the line payouts. Players will have to form combos of matching symbols, three at least, on any of the paylines that they have activated. Apart from the 100 winning chances, players can also earn great rewards with the help of the special symbols and through the bonus features of the slot game. On these 100 lines, players will see plenty of Irish themed symbols include a male Leprechaun in a green suit, a female leprechaun , a squirrel, the logo of the game and card symbols. The Auto Spin feature of this game allows players to place bets and choose a number of spins up to 999 spins so they can kick back and rack up on the great rewards that the game has as the reels spin automatically, one spin after the other. There is also the Max Bet button that places the highest stake and spins the reel automatically. Players can also control the speed of the spinning of the reels. The Golden Wild Icon is the game’s joker, which means that it is a wild symbol and whenever it lands anywhere on the reels, will act as a substitute and will replace any other symbols to form the highest paying combo possible. The only icon that it will not be able to substitute for is the Special Bonus Rainbow Symbol. This Rainbow symbol can trigger a very lucrative bonus round when it appears at the same time on the 1st and the last reel. It will activate the Rainbow Reward Bonus round.